The PETPlus is a unique test instrument designed for fast and safe solvent-free intrinsic viscosity (IV) measurement. The PETPlus method is both kinder to the environment, and saves on the high costs of purchase and disposal of solvents. 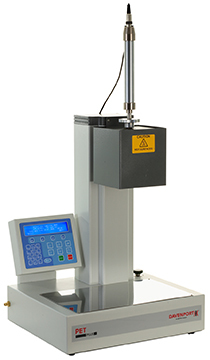 The Davenport PETPlus IV testing machine is a unique and solvent-free test instrument designed for fast and safe intrinsic viscosity (IV) measurement of moisture-sensitive polyethylene terephthalate (PET). The instrument can be operated in stand-alone mode to provide on-screen results, or used with the powerful data analysis software, NEXYGENPlus PET. Existing solvent methods for determining IV involve the need to handle and dispose of toxic solvents. The PETPlus method, however, is kinder to the environment and saves on the high costs of purchase and disposal of solvents. Unlike other IV measurement instruments, the PETPlus can test polymers at virtually all stages of the process: including incoming resin, powder, dry granules, molten polymer, performs, PET bottles, films, and even re-ground material, thereby eliminating scrap. Visit our Library to learn more about intrinsic viscosity and the PETPlus system. Request more information to see how we can help you with a IV measurement solution that suits your need. Find the Declaration of Conformity for the PETPlus IV testing machine here.